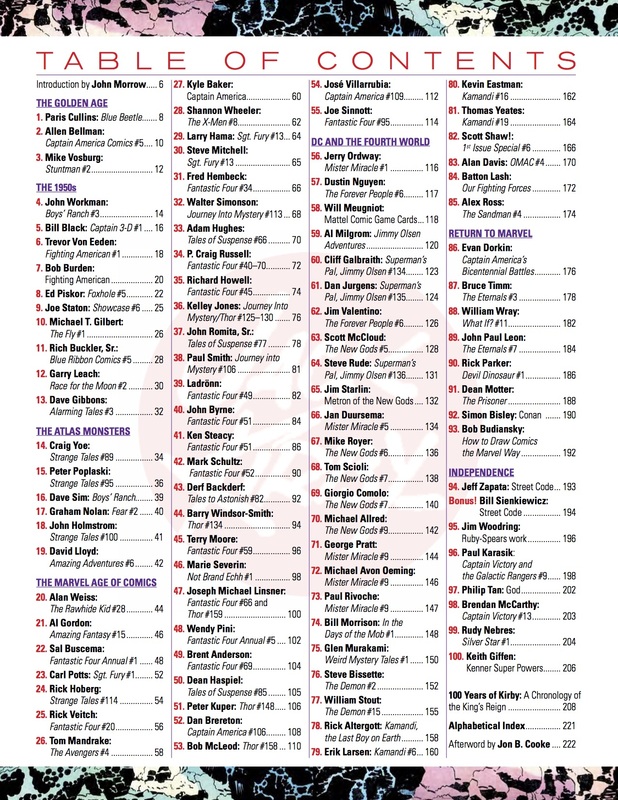 A salute to the King — featuring Alex Ross, Walt Simonson, Mike Allred, Joe Sinnott and many, many others! They’re not alone. Artists all over social media have been at it as well, and there are plans for commemorations come 8/28, the actual 100th anniversary of Kirby’s birth. What kind of names are we talking about? How about Alex Ross, Walt Simonson, Mike Allred and Kelley Jones. That not enough? How about Joe Sinnott, Dave Gibbons, John Byrne and Jerry Ordway? And many more — including art by Kirby and those paying tribute to his legacy. Now bookmark this post because we’ll be adding links every day throughout the 13 DAYS OF KIRBY 100. The book itself ships 8/28 and will be available in stores — or you can order it now from TwoMorrows. Now matter how you get it, get it. — ALLEN BELLMAN on CAPTAIN AMERICA COMICS #5. Click here. — WALTER SIMONSON on JOURNEY INTO MYSTERY #113, With THOR. Click here. — MIKE ALLRED on NEW GODS #9. Click here. — JOHN BYRNE on THIS MAN… THIS MONSTER! Click here. — DAVE GIBBONS on Kirby’s Sci-Fi and ALARMING TALES #3. Click here. — MARIE SEVERIN Pays Tribute to the King. Click here. — ALEX ROSS on SANDMAN #4. Click here. — CRAIG YOE on FIN FANG FOOM. Click here. — JOHN ROMITA SR. on CAPTAIN AMERICA and the KING. Click here. — CLIFF GALBRAITH on KIRBY’S Muscular Monster Machinery. Click here. — KELLEY JONES on THOR, HERCULES … and MOM! Click here. — JERRY ORDWAY on MISTER MIRACLE #1 and the FOURTH WORLD. Click here. 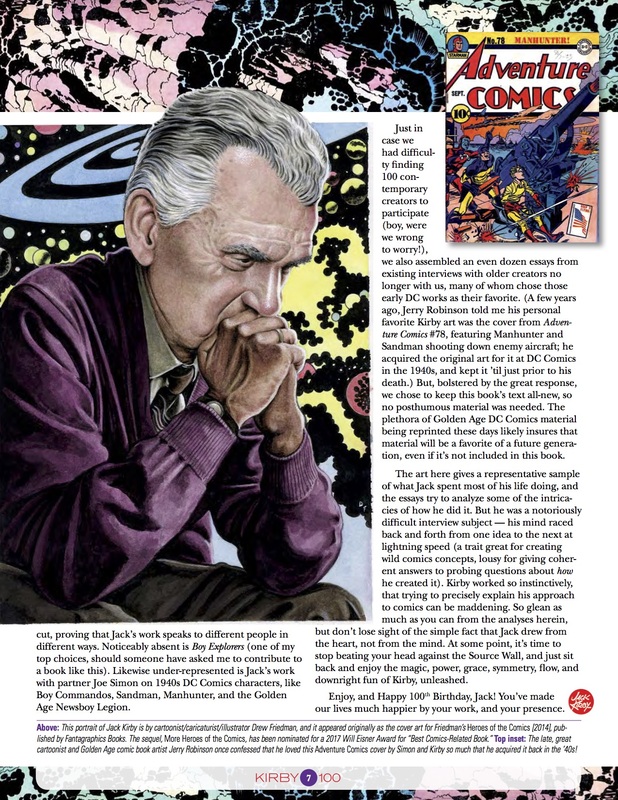 — JON B. COOKE: The Making of KIRBY 100. Click here. — 100 COVERS: A JACK KIRBY Centennial Celebration. Click here. 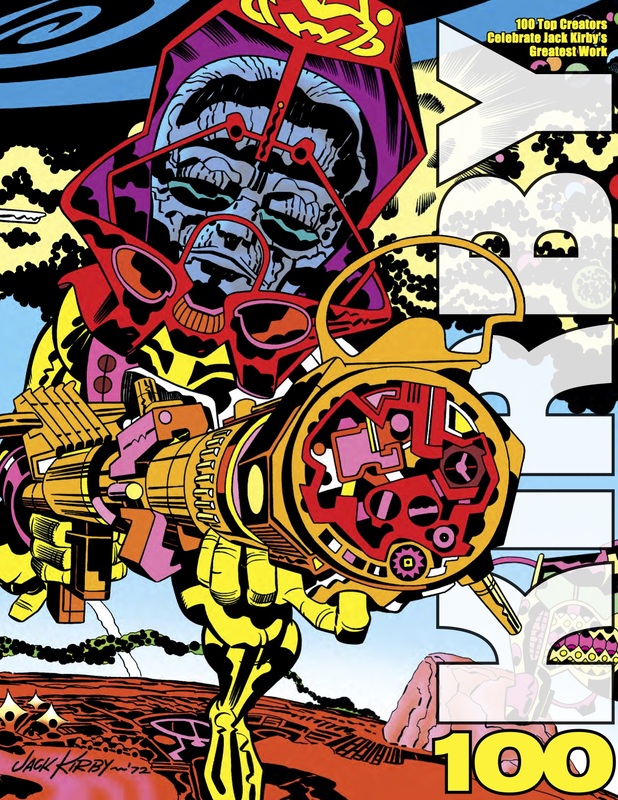 — MIKE ALLRED Ranks Kirby’s NEW GODS Covers. Click here. — Dig This Glorious Tribute to JACK KIRBY by Artist Elena Casagrande. (With commentary by Scott Tipton.) Click here. — REEL RETRO CINEMA: Rob Kelly on Kirby’s and Kubrick’s Powerfully Clashing Visions of 2001: A SPACE ODYSSEY. Click here. 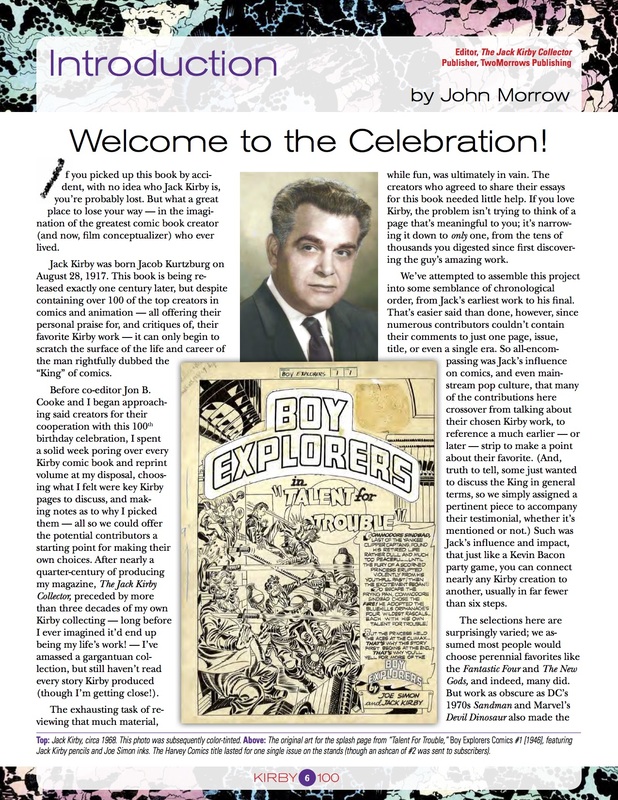 — KIRBY COLLECTOR’s JOHN MORROW: Kirby’s DC Work Will Prove More Influential Than His Marvel Years. Click here. — KIRBY Lecture Coming in October in NYC, With Historian Arlen Schumer. Click here.